Inflammatory bowel diseases (IBD), which is classified into Crohn’s disease and ulcerative colitis, are among chronic gastrointestinal diseases with unknown pathogenesis. Diverse strategies have been applied for the treatment of this chronic disease. However, selective and site-specific routes of drug delivery to the inflamed location of the colon remain of high importance. 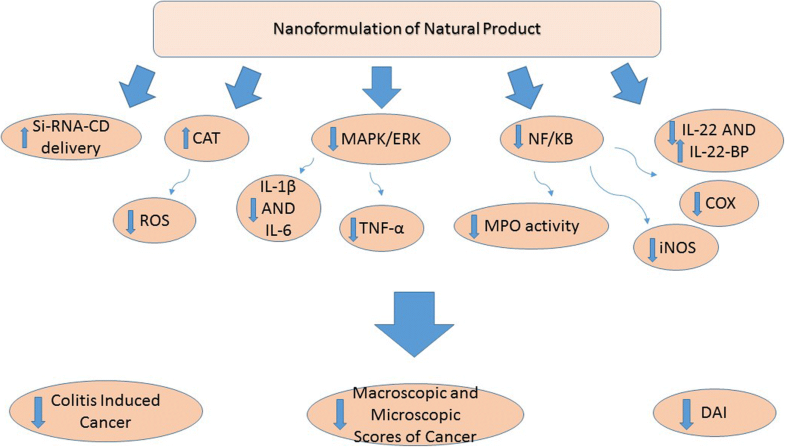 Consequently, the application and effects of natural products in the form of nanoformulation and stimuli responsive nanoparticles as a novel strategy for the treatment of IBD are discussed in this review article. This approach may potentially overcome some complications that are associated with conventional means of colon drug delivery. Meanwhile, in vitro and in vivo studies pave the way for understanding of the mechanism that lies behind this chronic relapsing disease and potentially more effective treatment. Inflammatory bowel disease (IBD), which affects millions of people all over the world, is a chronic, recurrent-remitting inflammation of the small intestine and colon that comprises ulcerative colitis (UC) and Crohn’s disease (CD). (1, 2) It is typified by periodic abdominal pain, vomiting, fever, bloody stool, diarrhea and weight loss, which can affect quality of life and enhance risk of colorectal cancer. (3, 4) Although the etiology of IBD is not completely understood, recent studies have shown that it is likely influenced by the interaction of environmental, genetic, and immunological factors. (5) Disturbance in synthesis and release of anti-inflammatory cytokines, including interleukin (IL)-4, IL-10, and IL-11 or transforming growth factor (TGF)-β, as well as pro-inflammatory cytokines, such as tumor necrosis factor α (TNF-α), interferon γ (IFN-γ), IL-1β, IL-6, and IL-12, and an extreme production of reactive oxygen species (ROS) results in tissue damage which may play a pivotal role in the intestinal inflammation (4, 6, 7). Natural and synthetic nanoparticles and microparticles, such as nanovesicles, liposomes, exosome-like nanoparticles, and micelles, improve bioavailability, stability, specificity, and biodistribution of natural products. (12) In addition to nano-sized and microsized drug delivery systems, specific delivery of medications to the inflamed areas of the intestinal tissue can increase the local concentration of the drugs and significantly reduce adverse effects caused by systemic absorption of drugs. (1, 6, 12) Therefore, natural nanoformulations have attracted the attention of investigators for further extensive research. The purpose of this current study is to review nanoformulation of natural products and discuss their mechanisms of actions for the treatment of IBD. Electronic databases, including “PubMed”, “Cochrane” and “Scopus,” were searched with the keywords “inflammatory bowel disease” or “colitis” in title/abstract along with “plant,” “herb,” “phytochemical,” “flavonoid,” or “polyphenol” in the full text. The term “nano” was excluded in the search due to the probability of exempting special methods and materials. Data was collected until January 2018 with a focus only on English language articles. Primary results were evaluated by two investigators. Articles regarding the in vivo and in vitro models of IBD were selected. From a total number of 2490 articles, 397 were excluded due to duplicated results, 10 were excluded because they were reviews, and 2047 were irrelevant based on title and/or abstract information. 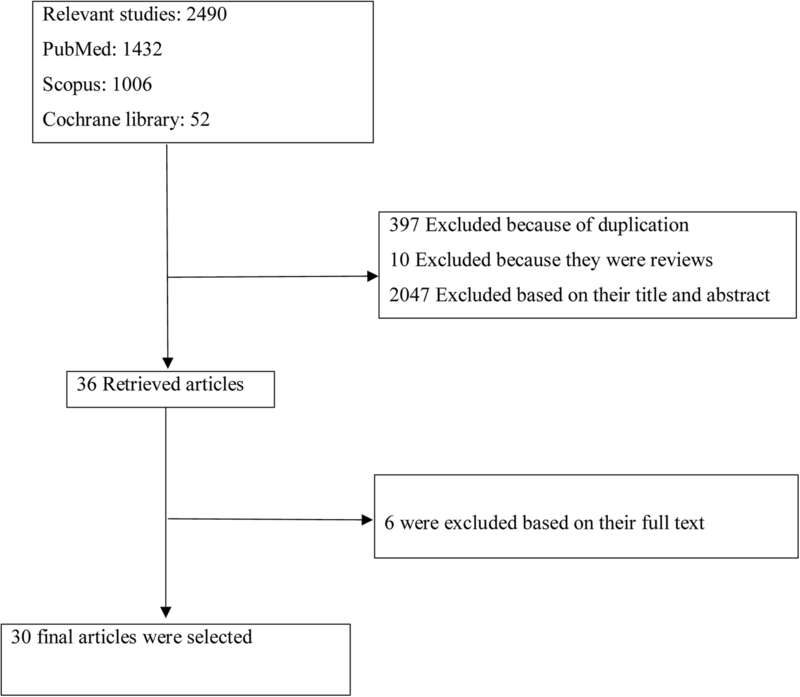 From 36 retrieved articles, 6 were excluded because of their full text and finally a total number of 30 articles were included in this review, as shown in a summary of results in Fig. 1. Targeted therapy based on the pathophysiology of inflammatory response in IBD is a recent advance, which is divided into three strategies: fabrication of inhibitors of inflammatory cytokines including TNF-α that results in T lymphocyte apoptosis, recognition of anti-inflammatory cytokines that down-regulate T lymphocyte proliferation, and synthesis of selective adhesion molecule inhibitors which suppress T lymphocyte transport into the gut epithelium. (8, 15) Studies have shown that anti-TNF-α agents are the most promising anti-colitis agents in the market. However, this agent must be administered systemically and its application is limited by significant side effects. Therefore, a suitable carrier system for targeted and specific drug delivery to the colon is required. (8, 15) The most relevant nanoformulation method used for colon delivery is the application of stimuli responsive nanoformulations, which will be discussed in detail in the next sections. Nanotechnology has greatly impacted diverse fields of science and research areas, and has made significant advances in the field of pharmaceuticals and drug delivery. (10, 16–18) Several types of modifications can be applied due to the nature of nanoparticles. The physical and chemical characteristics of polymers form stimuli responsive structures and the effects of controlled release of their encapsulated contents are currently being investigated. The stimuli are commonly classified into two groups: internal stimuli; including redox potential, endolysosomal pH, and enzymatic activities; and external physical stimuli including light, temperature, electric field, ultrasound and mechanical force. (18) Acheiving the proper response can be obtained through introduction of chemical groups into the polymer structure. The synthesized conformations are capable of chemical and physical changes including bond cleavage, swelling, membrane fusion, and disassembly in response to precise stimuli that subsequently result in structure disruption and release of contents. In the following section, recent progress in stimuli-responsive nanostructures for delivery of natural compounds to the colon region is investigated as well as the advantages and disadvantages of different strategies for the biomedical applications. Enzyme-mediated drug delivery occurs in the presence of specific enzymes including proteases, phospholipases, and glycosidases, which are dominant in pathological conditions, such as inflammation or cancer. With targeting, a polymeric structure that is susceptible to a specific enzyme, undergoes the cleavage process at the target site, leading the cargo to be released and its specific function to take place (28). Regarding this strategy, Castangia et al. (29) investigated the enzyme-sensitive and prebiotic complex of chitosan/nutriose polymer, which represented a promising procedure for oral delivery of quercetin (3,3′,4′,5,7-pentahydroxyflavone). Quercetin is a common flavonoid found in nature and a potential antioxidant and anti-inflammatory agent for the treatment of IBD in the colon. Chitosan is the most broadly used polymer for coatings of phospholipids and a mucoadhesive polysaccharide that is soluble at gastric pH 2, but is insoluble at a pH of 5.5 in the small intestine. However, regarding to the solubility of chitosan, it cannot be used alone to retain its structure in an acidic environment. 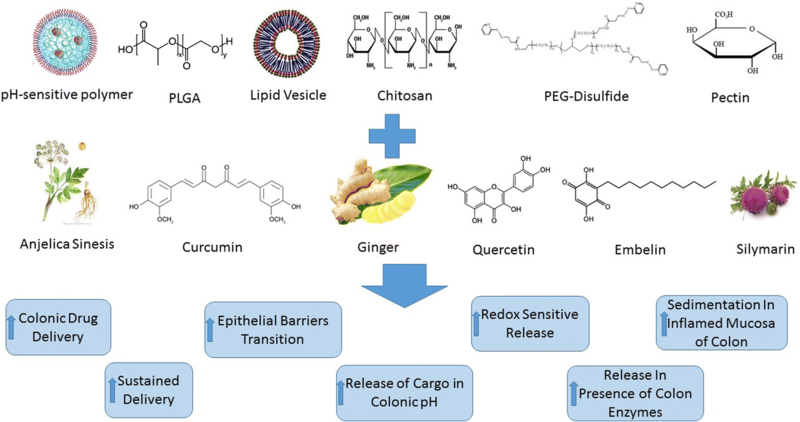 In this work, Quercetin-loaded polyethylene glycol (PEG) vesicles were coated with chitosan. Nutriose, a water soluble branched dextrin with high levels of fiber content, was added to the chitosan and the phospholipid vesicle with polysaccharide–starch complex formulation containing qurcetin was obtained. The total size of this system was 132 ± 6 nm. The chitosan-nutriose complex was less soluble than single polymers in the gastrointestinal fluids at pH 2–7, but was still susceptible to enzymatic degradation in the colon. Chitosan and nutriose have an inclination for hydrolysis into single monomers in the presence of colon enzymes. Furthermore, nutriose hydrolyzation products have been used as nutrients for endogenous microflora, which may proliferate and facilitate the reconstruction of physiological conditions in impaired tissue. Consequently, this system may be used for both prevention and treatment of chronic intestinal inflammation (29). Synthetic nanoparticles possess two significant problems. First, each part of the synthesized nanoparticles should be checked for possible in vivo toxicity prior to clinical applications. The second problem is limitations of production scale. Conversely, nanoparticles derived from natural sources are believed to have lower toxicity and are significantly more secure and cost effective, which can overcome the aforementioned shortcomings of synthetic nanoparticles. (34) Natural products with anti-colitis actions can be classified into antioxidants, phytochemicals, dietary fibers, lipids, and microorganisms. Phytochemicals include polyphenols or flavonoids and are among the popular natural products with anti-colitis action. The anti-colitis effects of phytochemicals are present in their ability to modulate the levels of pro-inflammatory cytokines, such as tumor necrosis factor-α (TNF-α), interleukin-1 (IL-1), and IL-6. In Fig. 2, different nanoformulations and their pharmaceutical advantages as anti-IBD agents is demonstrated. Natural polysaccharides are used for colon drug delivery, since they are easy to work with, non-toxic, US FDA approved, and selectively degraded in the colon area. (53) Polysaccharides are mainly divided into plant and animal sources; each source is classified into different types. The most widely studied natural polysaccharides, including pectin, cellulose, chitosan, and dextran, are broadly utilized for developing colon-specific drug delivery systems. Polysaccharides are selectively degraded in the colon and protect the drug formulation from premature release in the small intestine and stomach. Zhou et al. (54), presented polysaccharides of Angelica sinesis diels, a famous Chinese medicinal plant as a colon specific drug delivery system. This polysaccharide possesses an anti-inflammatory activity that inhibits neutrophil infiltration and gastrointestinal damage in rats. The angelica polysaccharide was used as a drug carrier and its monosaccharide, succinate, was used as a linker from which the dexamethasone polysaccharide conjugate was synthesized. This new polysaccharide conjugate is a successful colon-specific drug delivery system. (54) In another study by Li et al. (55), modified apple polysaccharides could potentially decrease the level of IL-22 and upregulate the expression of IL-22BP (55). Mechanisms of actions of natural nanoformulations in prevention and treatment of IBD are demonstrated in Fig. 3. In recent years, the development and application of nanotechnology has significantly impacted the field of drug delivery systems. The use of many natural metabolites or analogues are a potentially successful strategy for the search of new therapeutic agents against human diseases. Unfortunately, the pharmacological application of potentially active natural compounds in clinical trials has been limited due to their low oral bioavailability. In this review, the development and application of nanoparticles derived from natural compounds in a drug delivery system represent a major alternative approach to increasing treatment effectiveness of inflammatory human bowel disease. Nanoparticles are a useful alternative to enhance the bioavailability of natural compounds, both in vitro and in vivo investigations. Studies have shown that nanotechnology has the ability to deliver effective therapeutic agents to specific areas of the body, such as the colon, and control the release of natural bioactive metabolites. The purpose of nanoformulation is to create a reliable system that can encompass all the advantages of efficient delivery with a unique formulation. Advancements in the development of nanotechnology may improve achievement of higher concentrations of natural products, leading to higher intracellular drug concentration and improvement of effectiveness of natural agents in many human conditions, such as IBD. This preliminary nanoformulation system should behave consistently in case of alterations in gastro-luminal pH and enzyme profile in the colon environment as well as demonstrate optimal release profile regardless of immediate changes. Conventional routes of colon drug delivery, such as oral and IV administration are popular methods of treatment, but they cause some systemic complications, which have been lessened in the form of colon specific nanoformulation drug delivery. Thus, targeted delivery compounds in nanoformulations could be used to reduce side effects of IBD by acting in specific damaged areas and limiting potential toxicity. However, effective targeting remains a challenging issue that must be overcome with further studies. Nanoformulations are a novel method of drug administration because they are easy to manipulate, US FDA approved, non-toxic, and selectively and specifically degraded in the colon region. These qualities are promising materials for application in a colon specific drug delivery system. Researcher efforts in the advancement and development of nanoformulations have contributed significantly to the treatment of IBD as well as improvement of alternative treatments that were discussed in this review. Ultimately, this may lead to the prospect of stable and prolonged remissions in patients with reduced drug consumption. A correction to this article is available online at https://doi.org/10.1007/s40199-018-0230-4.